Nashville, TN- Vietti Chili and Southgate Foods will be spicing up their summer as they partner with the Mountain Man himself, William Lee Golden, for their exciting new promotion, The Discovery of Art. The 114 year-old Nashville-based company has chosen the country and gospel music legend to launch their new initiative that supports the visual arts. 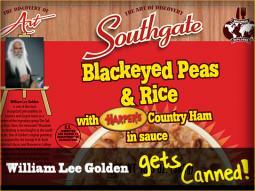 His iconic image will be depicted on all cans of Southgate Brand’s Blackeyed Peas and Rice. Distributed by Vietti Foods Company, Southgate brand products are available in 48 states, stocking the shelves in Dollar General, Dollar Tree and Family Dollar Stores as well as many Walmart stores. Over thirty items in their product line will feature on its labels uniquely-talented artists discovered around the country, including painters, sculptors, photographers and filmmakers. William Lee Golden has garnered high accolades as a member of the legendary groupThe Oak Ridge Boys. With over 30 million records sold, The Oak Ridge Boys have had more than a dozen #1 hits and over 30 top ten hits. Their numerous platinum and gold recordings include “Thank God For Kids,” “American Made,” “Bobbie Sue,” “Ozark Mountain Jubilee,” and the crowd favorite, “Elvira.” In addition to receiving five Grammy Awards throughout their career, they were inducted into both the Grand Ole Opry and the Gospel Music Hall of Fame. Golden has recently added the accomplishment of critically renowned painter to his ever-growing list of accolades. Inspired by his life on the road, Golden’s simple yet evocative paintings feature rich, sometimes dreamlike images that mirror the likes of Claude Monet and other leading French impressionist artists. His works have been exhibited in the Tennessee State Museum, The Gilcrease Museum of Art in Tulsa, as well as galleries and private collections across the U.S. His original painting of Bush Garden is amongst the permanent collection of The George H. W. Bush Presidential Library and Museum in College Station, Texas. To see William's works for yourself, visit www.williamleegolden.com. live music through partnerships with Music City Roots, Bluegrass Underground and The Country Network.